This week on Riverdale, a bear mauled Archie Andrews. While injured, he hallucinated playing a game of Gargoyles and Griffins in which the final quest was to cool himself. 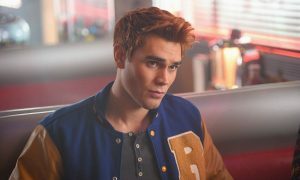 At the end of the episode, Archie was found possibly dead. An A-plot revolving around a hallucinated game was a tough sell. The episode did nothing to make it seem meaningful or relevant. It just went through previous plot points in Archie’s memory. Season three is way too early for a show to start cannablizing itself. 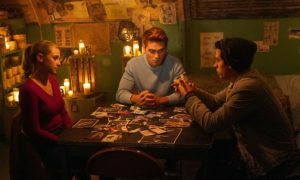 The feeling that Riverdale is completely out of ideas was cemented by the cliffhanger where they faked killing off Archie, which was just a retread of the cliffhanger where they faked killing off Jughead Jones. This cliffhanger was even worse, because of the allusions to suicidal ideation. Archie’s mental journey climaxed in the idea that he must kill himself for things to be okay. Presumably, in the literal sense it was the bear that did him in, but narratively this is essentially a suicide story. 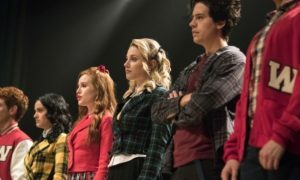 It was yet another reminder that Riverdale doesn’t care about things real teens go through. It seems to actively seek out teen tragedies to present in the most insensitive way possible. Speaking of which, Betty Cooper continued dealing with the convent that ran the gay conversion camp/mental institution. She kept posing as the “Griffin Queen” to tell these abused teenagers what to do. This truly bizarre plot has gone on way too long. Hiram Lodge continued running the town. He chose to send goons to harass Josie McCoy to show Veronica Lodge his power. After goons harassed her friend, Veronica verbally sparred with her father and then replace Josie by making herself the headliner at her club. It all added up to an exhausting episode with no real emotional stakes.